, featuring everyone’s favorite red bird, where you can compete in weekly tournaments. Also available is Ubisoft’s Driver Speedboat Paradise, where you race your boat through beautiful canals and waterways around the world. 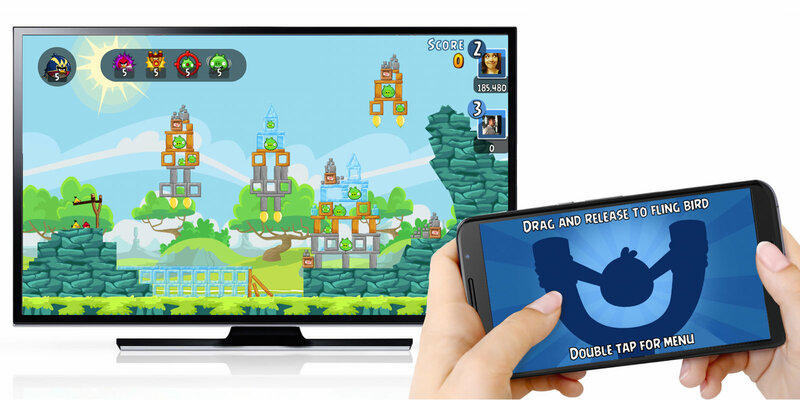 With Chromecast, you can get a great split-screen experience for your mobile games. For example, if you are playing Monopoly Here & Now, only you can see your cards on your phone while the moves you decide to make get displayed on the big screen. It unlocks fun multiplayer experiences, and the ability for you to use your phone or tablet as the controller while gameplay takes place on the TV. Many games now work with Chromecast, and many more will continue to be made available. So whether you’re playing with friends or by yourself, you can now play mobile games on the biggest screen in the house. Check out these great games and more on chromecast.com/apps. Whether you’re cozied up at home or on the road, Chromecast has a bunch of new goodies for you and the family. Just in time for the holidays, we’re adding more Chromecast-enabled games for both Android and iOS to the list. Now casting is Rovio’s Angry Birds Friends, featuring everyone’s favorite red bird, where you can compete in weekly tournaments. Also available is Ubisoft’s Driver Speedboat Paradise, where you race your boat through beautiful canals and waterways around the world. on your phone or desktop to wield your very own lightsaber in our latest Chrome Experiment, “Lightsaber Escape,” built for your phone and computer. Inspired by Star Wars: The Force Awakens, “Lightsaber Escape” immerses you in a galaxy far, far away, bringing the film to life through modern web technologies. Your adventure begins in a Star Destroyer, where you’ll need to use your phone as a lightsaber to escape the First Order. The experience was developed in collaboration with Disney, Lucasfilm and Industrial Light & Magic. The rich 3D graphics were built with WebGL, enabling beautiful, high fidelity 3D renders within the browser. We’re also using WebRTC and WebSockets to enable high accuracy, real-time communication between your mobile and desktop devices, reducing latency and improving interactivity. Plus, building with web standards means the experience works across browsers, and without plug-ins. For a more in-depth tech overview, you can check out our technical case study on developers.google.com. Visit google.com/starwars to experience Star Wars: The Force Awakens across your favorite Google apps and explore Jakku Spy, a Google Cardboard Experience. You don’t need to be a Jedi to master a lightsaber — just go to g.co/lightsaber on your phone or desktop to wield your very own lightsaber in our latest Chrome Experiment, “Lightsaber Escape,” built for your phone and computer. to provide an easy way to stream your favorite tunes from your phone, tablet, or laptop to your existing speakers. At $35, Chromecast Audio is an affordable way to connect your speakers via WiFi so you can stream tons of popular apps including Spotify, Pandora, and Google Play Music from anywhere in your home. Today we’re starting to add two new features to the latest software update to elevate your listening experience. Close your eyes and imagine the musician is playing in the room. Today we’re rolling out high-resolution audio support, which gives you even higher quality music playback using Chromecast Audio. With support of up to 96KHz/24bit lossless audio playback, you can enjoy higher-than-CD-quality audio on your existing high fidelity audio equipment. Now you can easily fill every room in your home—bedroom, kitchen, living room, or wherever you have a Chromecast Audio connected—with synchronous music. Multi-room lets you group Chromecast Audio devices together so you can listen to the same song on multiple speakers. Setup is simple. Connect and setup a Chromecast Audio device for each of your speakers, then use the latest Chromecast app to create a group. You can cast to the group the exact same way you would cast to a single Chromecast device. Since anyone with a phone can easily cast without pairing, you can sync your home speakers together and invite your friends to be the DJ. So grab your hairbrush microphone, dust off your tennis racket guitar, and jam out to your favorite tunes at amazing quality and in every room of your house. A couple of months ago we launched Chromecast Audio to provide an easy way to stream your favorite tunes from your phone, tablet, or laptop to your existing speakers. At $35, Chromecast Audio is an affordable way to connect your speakers via WiFi so you can stream tons of popular apps including Spotify, Pandora, and Google Play Music from anywhere in your home. Today we’re starting to add two new features to the latest software update to elevate your listening experience. Accessing mobile websites on a slow connection can be frustrating: it can eat up your data, and it takes work to keep track of your usage. With that in mind, we created Data Saver mode in Chrome, which reduces the amount of data used when you visit a webpage. Now, we're updating this mode to save even more data – up to 70 percent! – by removing most images when loading a page on a slow connection. After the page has loaded, you can tap to show all images or just the individual ones you want, making the web faster and cheaper to access on slow connections. Chrome users in India and Indonesia will be the first to get this expanded Data Saver mode, with additional countries in the coming months. Just flip on Data Saver mode in your Chrome app on Android devices to get rolling! Safe Browsing has been protecting over one billion people from traditional phishing attacks on the web for more than eight years. The threat landscape is constantly changing -- bad actors on the web are using other types of deceptive behavior to trick you into performing actions that you didn’t intend or want, so we’ve expanded protection to include social engineering. The content pretends to act, or looks and feels, like a trusted entity — like a bank or government. The content tries to trick you into doing something you’d only do for a trusted entity — like sharing a password or calling tech support. Below are some examples of social engineering attacks that try to trick you into thinking the content is delivered by Google or Chrome. Other trusted brands are also commonly abused for social engineering attacks. 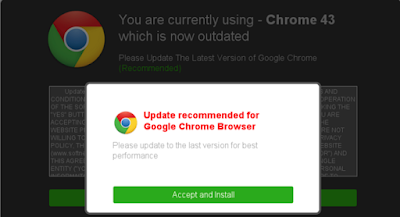 This page tries to trick you into downloading and executing malware or unwanted software. It uses Chrome’s logo and name to confuse you into believing the site is operated by Google. Content like this may include an inconspicuous legal disclaimer that states it is not affiliated with Google. This does not change the deceptive nature of this content -- as always, use caution when downloading files from the web. This is a fake tech phone support page. This page mimics a warning and may trick you into calling a third-party company that pretends to be Google or some other trusted entity, but charges a fee for support. (Chrome does not offer paid remote support). This is a fake Google login page. It might trick you into disclosing your account login credentials. Other phishing sites like this could trick you into giving up other personal information such as credit card information. Phishing sites may look exactly like the real site -- so be sure to look at the address bar to check that the URL is correct, and also check to see that the website begins with https://. See more information here. If we identify that a web page contains social engineering content, Chrome will warn you by displaying the following interstitial. We'll continue to improve Google's Safe Browsing protection to help more people stay safer online. Check out the Safe Browsing Transparency Report to find out more. that Google Chrome would continue support for Windows XP through the remainder of 2015. At that time, we strongly encouraged users on older, unsupported platforms such as Windows XP to update to a supported, secure operating system. Such older platforms are missing critical security updates and have a greater potential to be infected by viruses and malware. If you are still on one of these unsupported platforms, we encourage you to move to a newer operating system to ensure that you continue to receive the latest Chrome versions and features. Earlier this year, we announced that Google Chrome would continue support for Windows XP through the remainder of 2015. At that time, we strongly encouraged users on older, unsupported platforms such as Windows XP to update to a supported, secure operating system. Such older platforms are missing critical security updates and have a greater potential to be infected by viruses and malware. Chrome OS can take, introduced the first designated Chromebook for Work, and brought more of your favorite Android apps to your Chromebook via Apps Runtime on Chrome (a.k.a. ARC). But there’s more to do. We have plans to release even more features for Chrome OS, such as a new media player, a visual refresh based on Material Design, improved performance, and of course, a continued focus on security. With our regular six-week software cycle and guaranteed auto-updates for five years, Chromebooks keep getting better over time. Finally, stay on the lookout for dozens of new Chromebooks in 2016. Over the last few days, there’s been some confusion about the future of Chrome OS and Chromebooks based on speculation that Chrome OS will be folded into Android. While we’ve been working on ways to bring together the best of both operating systems, there's no plan to phase out Chrome OS. With the launch of Chrome OS six years ago, we set out to make computers better—faster, simpler and more secure—for everyone. We’ve since seen that vision come to life in classrooms, offices and homes around the world. In fact, every school day, 30,000 new Chromebooks are activated in U.S. classrooms—that’s more than all other education devices combined. And more than 2 million teachers and students in more than 150 countries have the Share to Classroom Chrome extension, which launched in September and gets students onto the same webpage, instantly. Meanwhile, companies such as Netflix, Sanmina, Starbucks and of course Google, are using Chromebooks given the ease of deployment, the ability to easily integrate with existing technologies, and a security model that protects users at all levels, from hardware to user data. (Chromebooks are so secure you don’t need antivirus software!) IT administrators can manage tens of thousands of Chromebooks through a single web console, making them ideal for both classrooms and the workplace. For everyday use, we’re proud that Chromebooks are continually listed as a best-selling laptop computer on Amazon.com. In an effort to make computing even more accessible, earlier this year we introduced the first $149 Chromebook—a fast, affordable laptop. And in the next couple weeks the Asus Chromebit will be available—an $85 device that turns any display into a computer so you can replace your old desktop with an affordable computer the size of a candy bar, or let businesses transform a billboard into a smart digital sign. This year we've also worked to redefine the different forms Chrome OS can take, introduced the first designated Chromebook for Work, and brought more of your favorite Android apps to your Chromebook via Apps Runtime on Chrome (a.k.a. ARC). But there’s more to do. We have plans to release even more features for Chrome OS, such as a new media player, a visual refresh based on Material Design, improved performance, and of course, a continued focus on security. With our regular six-week software cycle and guaranteed auto-updates for five years, Chromebooks keep getting better over time. Finally, stay on the lookout for dozens of new Chromebooks in 2016.
, binge-watching Breaking Bad or learning about NASA’s Pluto mission—no matter what you watch, we make sure that your videos look great and load fast when you’re using Chrome. Videos today have higher resolution, richer color and more frames per second. That's great news for you, but as video quality increases, it's harder to stream and play it without interruption. So we’ve been working on keeping Chrome lean so you can watch eye-poppingly high-definition videos. 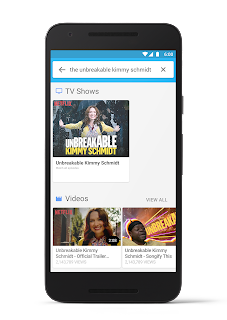 When you use Chrome to watch video on sites like YouTube, your videos load faster and look better than ever before. That's because Chrome supports the VP9 video format, which uses up to 40% less data and higher quality videos. We optimize for your data plan, battery life and processing power without sacrificing quality and with support for the latest high-definition formats. We’ve also worked with partners like YouTube and Amazon to reduce power consumption up to 25% by transitioning away from Flash. Videos really are moving pictures—each picture is called a “frame”. Those frames are recorded by a video camera, and then displayed at regular intervals by your screen so you can see it as a smooth video. A typical video is recorded at 30 frames per second, and a typical screen displays at 60 times a second—so ideally, one frame is on the screen for two refreshes, and you see smooth video. Often that doesn’t happen—many videos aren’t recorded at exactly 30 frames per second, and many screens don’t display at exactly 60 times per second—which leads to inconsistent or jerky video. We’ve been working to take account of these variations in Chrome, so we can more consistently hit two frames per refresh. That means your video looks smoother. In this example, 32% of video frames are displayed for the wrong length of time and 5 frames never display. Now almost all frames are shown at regular intervals, and every frame is displayed. Your connection may not always be perfect, so we helped build a new open standard that your video provider uses to intelligently adjust video settings—and if your Internet connection speed dips, video quality will adjust without your input. That means you get up to 50% fewer video interruptions. Watching videos on the web used to require downloading and installing a plugin. 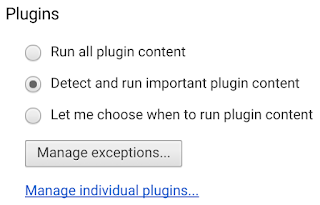 Plugins are separate programs from the browser and can cause problems, including malware and tracking of your browsing habits across websites. To combat this, we’ve been working with our partners to create new web standards to support premium content through HTML5. Many leading video providers like YouTube, Amazon and Play Movies now use these standards to deliver video in Chrome, so you don’t have to worry about nasty surprises. With Chrome, you get the fastest, safest experience while you watch. So you can explore all the great video on the web—to learn, play or get inspired! Chrome is one of the world's most popular ways to watch video, with around 3,000 hours of video watched every second. Whether you're singing along with Taylor Swift, binge-watching Breaking Bad or learning about NASA’s Pluto mission—no matter what you watch, we make sure that your videos look great and load fast when you’re using Chrome. We’re also working to make it easier to make purchases on the go. We’re shopping more often than ever on our phones and tablets, but it can be a pain to re-enter credit card information every time you buy something. That’s why we’re bringing Chrome’s Autofill from desktop and Android to iOS. No matter what device you use, you can shop for what you need easily and securely. To get the latest & greatest for your iPhone / iPad, just update Chrome in the App Store. Often on the web, we’re doing a ton of things at once -- reading up on an exotic travel location, catching up on social media or booking a hotel. 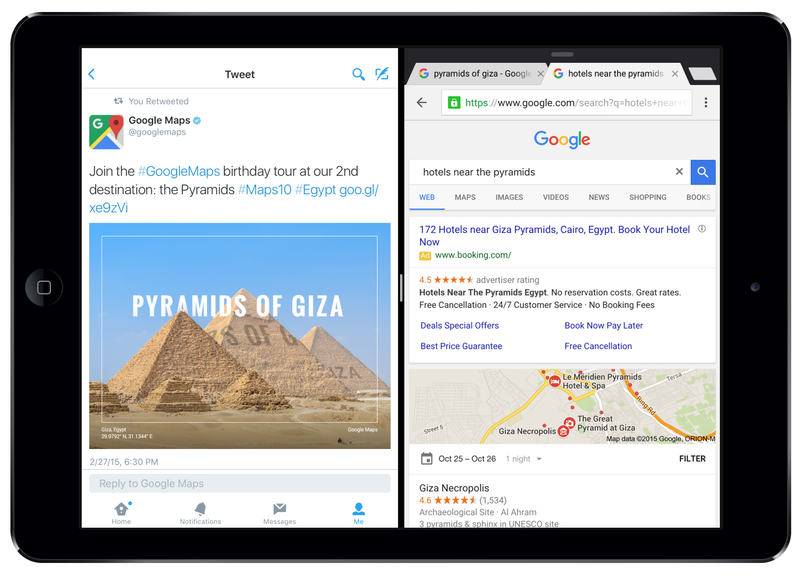 With that in mind, we’re introducing Split View for your iPad (Air 2 or mini 4) to our latest version of Chrome. 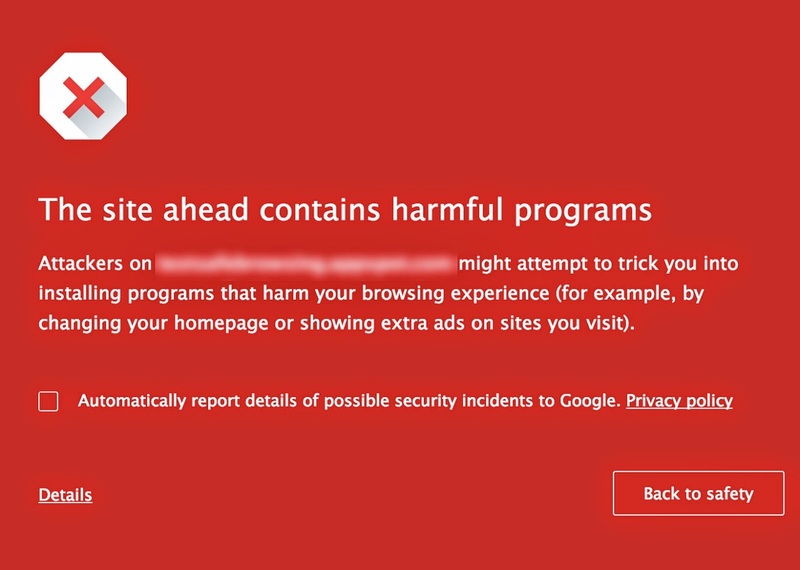 You’re browsing the web, checking out the latest news on your favorite band, when suddenly you see a red warning screen: “The site ahead contains malware.” These warnings aren’t new—since 2006, Google Safe Browsing has shown them when you navigate to an unsafe site. The warnings protect you from harms caused by unsafe sites, such as malware infections and phishing attacks. But it hasn’t always been clear why a specific website triggers a warning, and you may want to learn more. To demystify these warnings, we’re launching a Site Status section in the Transparency Report. The next time you come across a Safe Browsing warning, you can search for the blocked website in the Transparency Report to learn why it’s been flagged by our systems. 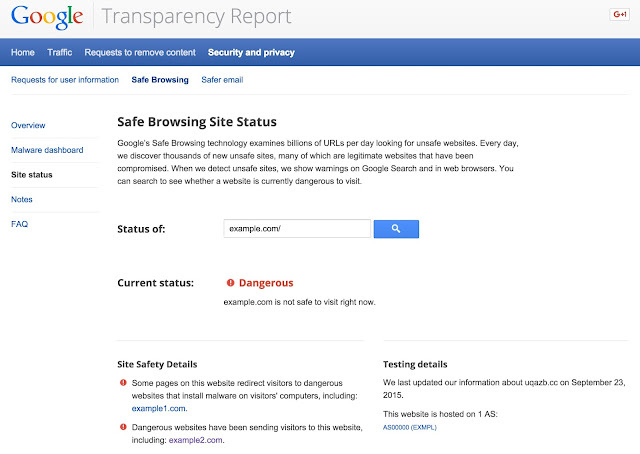 The new Site Status section of the Transparency Report replaces our previous Safe Browsing diagnostic page. It includes a clearer interface and simpler explanations of the issues, such as details for sites that host unwanted software. We’ve added it to the Transparency Report so that the Safe Browsing section of the report is a one-stop shop for information to help you understand what Safe Browsing is and how it works. We’re constantly working to keep users safe and informed online. Visit the updated Site Status section in the Transparency Report to experience it yourself. has faster performance, a new design and is available in three colors. Chromecast Audio is a small device that plugs into your existing speakers, so you can stream your favorite tunes from your phone, similar to Chromecast. 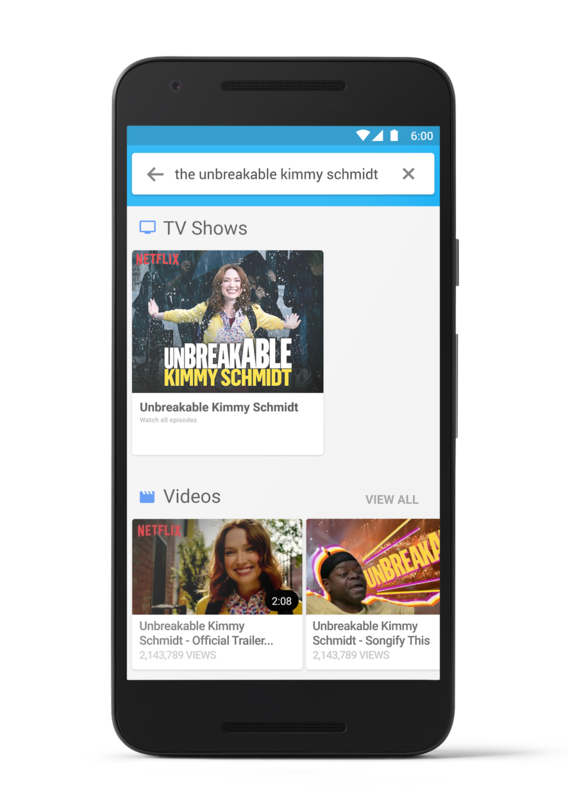 We’re also introducing an easier way to find what to watch through the redesigned Chromecast app. 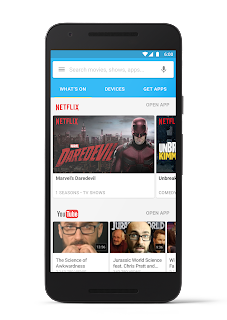 Now, you can go to a single place to browse or search content from across apps you already use. The Chromecast app is available on Android starting today and rolling out to iOS over the coming weeks. It’s fall premiere season-- catch up on your favorites. Chromecast can help you burn through the last season of Homeland on Showtime before the next season premieres in October. Or choose from over 200,000 TV shows and movies from favorites like Netflix, Google Play Movies, HBO Now, Hulu, CW Seed, WatchABC and WatchDisney, with SlingTV coming soon. Never miss your favorite sports game. With recently-launched NFL Sunday Ticket by DirecTV, you can cast live games (even those that aren’t nationally televised) to the TV. Check the scores and stats from the mobile app while watching the action live on TV. Chromecast works with WatchESPN, MLB At Bat, CBS Sports and many others. NBA, NHL and BTN2Go are coming soon. Score a last-minute party playlist. You’re throwing a party and forgot to make a playlist. With Chromecast Audio, anyone in your house (and on your WiFi) can DJ using their phone to cast to the speakers—no additional pairing or set up necessary. Choose from over 35 million songs on Spotify, Google Play Music, Pandora iHeartRadio and more. Give game night a twist. Turn your TV screen into a race track, golf course or dance floor. Chromecast takes popular mobile games and brings them to the big screen. 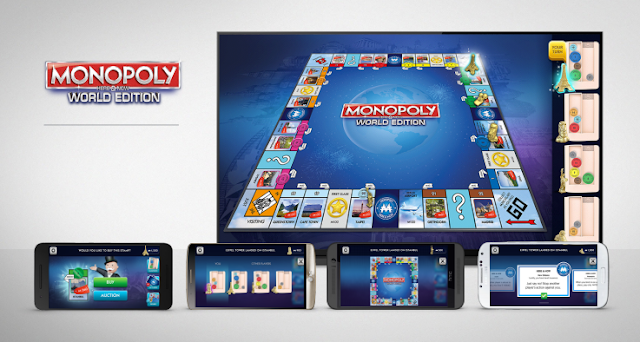 Anyone can join in, using their Android phone or iPhone® as a game controller. Soon, we’ll be adding Angry Birds Go!, WGT Golf, and Driver Speedboat Paradise. Available now are classics like Just Dance Now, Catch Phrase Blitz, and Scrabble Blitz. Relive the weekend. Before you completely dive back into the real world on Monday morning, share your weekend memories. With Google Photos, cast any picture from your albums to the TV for a bigger picture, while using your phone to swipe to the next one. You can also turn your TV screen into a picture frame filled with photos from Facebook, Google Photos, Flickr, Getty Images, 500px and more. Visit chromecast.com/backdrop to find out more. Cast the morning news. With Chromecast Audio, cast talk shows like NPR One to your bedroom speakers while you're getting ready for work. 30 days of access to Crunchyroll Premium. Visit chromecast.com/offers* to learn more. Your phone is bursting with entertainment. With Chromecast and Chromecast Audio, you can enjoy your content on the biggest screen and best speakers in the home. * Terms apply. For more information, visit chromecast.com/offers. Please note that some of the apps referenced above require subscriptions. Today, we introduced a new Chromecast and its partner-in-crime, Chromecast Audio. Chromecast has faster performance, a new design and is available in three colors. Chromecast Audio is a small device that plugs into your existing speakers, so you can stream your favorite tunes from your phone, similar to Chromecast. founding principles of Chrome. As the web evolves and sites take advantage of increasing capabilities, Chrome’s performance—how fast pages load, how smooth scrolling is, how much memory is consumed, and how long your battery lasts—becomes even more important. So in the latest release of Chrome we’ve included a ton of improvements to make your browsing use less memory and power. Chrome has long had the option to “continue where you left off” by restoring tabs when you relaunch Chrome. Now, Chrome is smarter about restoring your tabs more efficiently. Tabs are restored from most to least recently viewed, so you get to see the most important tabs faster. And Chrome will now detect if your computer is running low on resources and stop restoring the rest of your tabs to save you precious memory. You can always click to restore them if you'd like to access them later. We’ve also introduced another memory-saving technique. Chrome can now detect when a webpage isn't busy with some other task, and use the free time to aggressively clean up old, unused memory. In practice we found that this reduced website memory usage by 10% on average, but the effect is even more dramatic on complex web apps. With Gmail, for example, we can free up nearly a quarter of the memory used by the tab. After being idle for a short time, Chrome 45 (right) frees up nearly a quarter of the memory it was using for Gmail, a significant improvement compared to Chrome 43 (left). Video is sped up 8x. We’ve also made changes to Chrome to improve power usage. A new setting introduced in June will auto-pause Flash content that's not central to a website. Our testing has shown that turning on this setting makes your battery last up to 15% longer depending on your operating system, so over the next few weeks we'll begin turning on this feature by default for all users. This latest version of Chrome includes the most recent wave of performance updates, but there's much more in the works for upcoming versions of Chrome. So get ready for faster, even more powerful browsing! Speed is one of the founding principles of Chrome. As the web evolves and sites take advantage of increasing capabilities, Chrome’s performance—how fast pages load, how smooth scrolling is, how much memory is consumed, and how long your battery lasts—becomes even more important. So in the latest release of Chrome we’ve included a ton of improvements to make your browsing use less memory and power. Fans can catch up on Game of Thrones® and other favorites, tune in live for new episodes of Ballers(sm) and True Detective® or catch up on every season of Girls®. HBO NOW(sm), the new standalone subscription service from HBO®, allows you to stream shows at the same time they air on TV without a cable subscription. We’re always looking for new and innovative ways to use your phone as a remote or game controller, which has lead us to new social games like FitFlap and Catch Phrase Blitz. FitFlap, by BreakFirst, uses the front-facing camera on the phone to capture players flapping their arms. The harder you flap, the higher pigs on the screen fly to collect coins while dodging obstacles. More into brain games? Catch Phrase Blitz, the classic Hasbro guessing game, is now casting and is sure to bring excitement to your next party. Or try your hand at a more strategic, turn-based gameplay with Tricky Titans by MediaMonks. These giant Titans are standing on top of villages and using large shovels to scoop up houses and throw them at each other. Budding photographers will be pleased to know that Pixlr is also available — a fun and powerful photo editor that lets you quickly crop, rotate, and fine-tune any picture. Foodies and travel gurus can now cast their favorites on the Watch Food Network and Watch Travel Channel apps, including Cutthroat Kitchen, Beat Bobby Flay, and Hotel Impossible. And finally for the kiddos, on Pokemon TV dozens of episodes featuring Ash and Pikachu are available for you to watch and rewatch as much as you like. Anyone with a phone or tablet can join the fun. Download these apps from the Play Store or App Store so all of your family and friends can tune in, flap, swing, shout, smash, and dance, or binge on their favorites. A subscription is required for some content. Summer is the perfect time to get together with friends, watch TV shows, movies and play some games. Starting today, you’ll find either new cast-enabled apps for Chromecast to enjoy on the big screen. Often when we use our mobile phones, it's for something fast in the moment. We see a food item we can’t identify, or hear a song lyric, and want to know more—quick answers to quick questions. So we’re bringing a new feature to Chrome—search from any webpage with just a tap. Since Chrome can see the page you’re searching from, it can give you more accurate search results. For example, just tapping on “America” on the page below shows a search about the movie “Captain America: Civil War”, not the country. Just slide up to see more information—news, cast, images and more. This is coming to Chrome on Android over the next few days (with Asian language support to follow). allows web pages to display rich content—but sometimes that can put a squeeze on your laptop’s battery. So we’ve been working with Adobe to ensure that your experience on the web can be power-efficient as well as rich and interactive—and today, we’re introducing an update to Chrome that does just that. When you’re on a webpage that runs Flash, we’ll intelligently pause content (like Flash animations) that aren’t central to the webpage, while keeping central content (like a video) playing without interruption. If we accidentally pause something you were interested in, you can just click it to resume playback. This update significantly reduces power consumption, allowing you to surf the web longer before having to hunt for a power outlet. We'll be rolling out more power improvements in the coming months - stay tuned! Adobe Flash allows web pages to display rich content—but sometimes that can put a squeeze on your laptop’s battery. So we’ve been working with Adobe to ensure that your experience on the web can be power-efficient as well as rich and interactive—and today, we’re introducing an update to Chrome that does just that. is now casting shows like The Big Bang Theory and NCIS. And for those seeking a little outside inspiration for their summer project, indulge in new HGTV episodes of Property Brothers and Fixer Upper. EMPIRE fans, we’ve got you covered too. You can now stream the entire first season and catch up before Season 2 starts in the fall, or watch Brooklyn Nine-Nine using FOX NOW, as well as The Americans and Louie using FXNOW. Finally, check out the streaming service Pluto TV which curates over 100 channels of news, music, sports, web and TV shows, or Haystack—a news app that is tuned specifically to your interests so that you can keep up with current events and happenings around the world. Note that you may need to sign in with a subscription or participating TV provider account to access some content. Make sure to update your apps and find the latest on chromecast.com/apps. If you're looking forward to catching-up on all the hot TV shows this summer, get ready to binge out with Chromecast. There's a little something for everyone to enjoy, and here are another half dozen apps for your viewing pleasure. CBS All Access is now casting shows like The Big Bang Theory and NCIS. And for those seeking a little outside inspiration for their summer project, indulge in new HGTV episodes of Property Brothers and Fixer Upper. In March, we outlined the problems with unwanted ad injectors, a common symptom of unwanted software. Ad injectors are programs that insert new ads, or replace existing ones, into the pages you visit while browsing the web. We’ve received more than 100,000 user complaints about them in Chrome since the beginning of 2015—more than any other issue. Unwanted ad injectors are not only annoying, they can pose serious security risks to users as well. Today, we’re releasing the results of a study performed with the University of California, Berkeley and Santa Barbara that examines the ad injector ecosystem, in-depth, for the first time. We’ve summarized our key findings below, as well as Google’s broader efforts to protect users from unwanted software. The full report, which you can read here, will be presented later this month at the IEEE Symposium on Security & Privacy. Ad injectors’ businesses are built on a tangled web of different players in the online advertising economy. This complexity has made it difficult for the industry to understand this issue and help fix it. We hope our findings raise broad awareness of this problem and enable the online advertising industry to work together and tackle it. 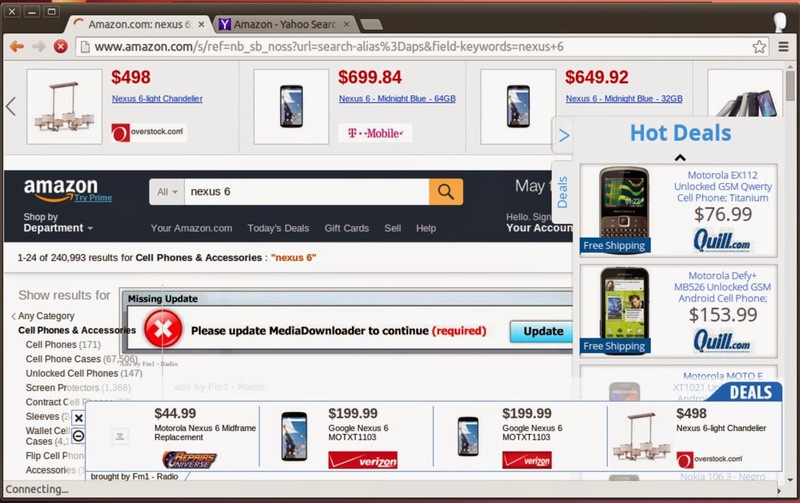 This is what users might see if their browsers are infected with ad injectors. None of the ads displayed appear without an ad injector installed. To pursue this research, we custom-built an ad injection “detector” for Google sites. This tool helped us identify tens of millions of instances of ad injection “in the wild” over the course of several months in 2014, the duration of our study. More detail is below, but the main point is clear: deceptive ad injection is a significant problem on the web today. We found 5.5% of unique IPs—millions of users—accessing Google sites that included some form of injected ads. The ad injection ecosystem comprises a tangled web of different players. Here is a quick snapshot. Software: It all starts with software that infects your browser. We discovered more than 50,000 browser extensions and more than 34,000 software applications that took control of users’ browsers and injected ads. Upwards of 30% of these packages were outright malicious and simultaneously stole account credentials, hijacked search queries, and reported a user’s activity to third parties for tracking. In total, we found 5.1% of page views on Windows and 3.4% of page views on Mac that showed tell-tale signs of ad injection software. Distribution: Next, this software is distributed by a network of affiliates that work to drive as many installs as possible via tactics like: marketing, bundling applications with popular downloads, outright malware distribution, and large social advertising campaigns. Affiliates are paid a commision whenever a user clicks on an injected ad. We found about 1,000 of these businesses, including Crossrider, Shopper Pro, and Netcrawl, that use at least one of these tactics. Injection Libraries: Ad injectors source their ads from about 25 businesses that provide ‘injection libraries’. Superfish and Jollywallet are by far the most popular of these, appearing in 3.9% and 2.4% of Google views, respectively. These companies manage advertising relationships with a handful of ad networks and shopping programs and decide which ads to display to users. Whenever a user clicks on an ad or purchases a product, these companies make a profit, a fraction of which they share with affiliates. Ads: The ad injection ecosystem profits from more than 3,000 victimized advertisers—including major retailers like Sears, Walmart, Target, Ebay—who unwittingly pay for traffic to their sites. Because advertisers are generally only able to measure the final click that drives traffic to their sites, they’re often unaware of many preceding twists and turns, and don’t know they are receiving traffic via unwanted software and malware. Ads originate from ad networks that translate unwanted software installations into profit: 77% of all injected ads go through one of three ad networks—dealtime.com, pricegrabber.com, and bizrate.com. Publishers, meanwhile, aren’t being compensated for these ads. We pursued this research to raise awareness about the ad injection economy so that the broader ads ecosystem can better understand this complex issue and work together to tackle it. Keeping the Chrome Web Store clean: We removed 192 deceptive Chrome extensions that affected 14 million users with ad injection from the Chrome Web Store. These extensions violated Web Store policies that extensions have a narrow and easy-to-understand purpose. We’ve also deployed new safeguards in the Chrome Web Store to help protect users from deceptive ad injection extensions. 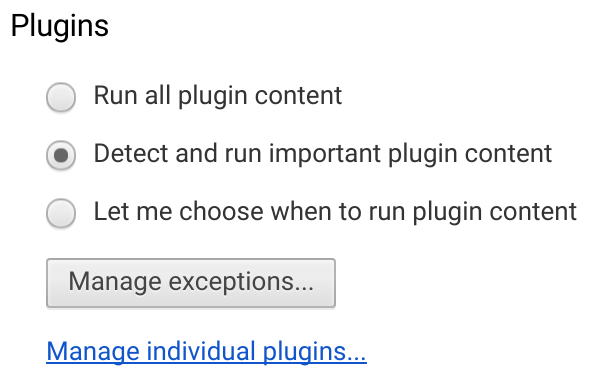 Protecting Chrome users: We improved protections in Chrome to flag unwanted software and display familiar red warnings when users are about to download deceptive software. These same protections are broadly available via the Safe Browsing API. We also provide a tool for users already affected by ad injectors and other unwanted software to clean up their Chrome browser. Informing advertisers: We reached out to the advertisers affected by ad injection to alert each of the deceptive practices and ad networks involved. This reflects a broader set of Google Platforms program policies and the DoubleClick Ad Exchange (AdX) Seller Program Guidelines that prohibit programs overlaying ad space on a given site without permission of the site owner. Most recently, we updated our AdWords policies to make it more difficult for advertisers to promote unwanted software on AdWords. It's still early, but we've already seen encouraging results since making the change: the number of 'Safe Browsing' warnings that users receive in Chrome after clicking AdWords ads has dropped by more than 95%. This suggests it's become much more difficult for users to download unwanted software, and for bad advertisers to promote it. Our blog post from March outlines various policies—for the Chrome Web Store, AdWords, Google Platforms program, and the DoubleClick Ad Exchange (AdX)—that combat unwanted ad injectors, across products. We’re also constantly improving our Safe Browsing technology, which protects more than one billion Chrome, Safari, and Firefox users across the web from phishing, malware, and unwanted software. Today, Safe Browsing shows people more than 5 million warnings per day for all sorts of malicious sites and unwanted software, and discovers more than 50,000 malware sites and more than 90,000 phishing sites every month. Considering the tangle of different businesses involved—knowingly, or unknowingly—in the ad injector ecosystem, progress will only be made if we raise our standards, together. We strongly encourage all members of the ads ecosystem to review their policies and practices so we can make real improvement on this issue. 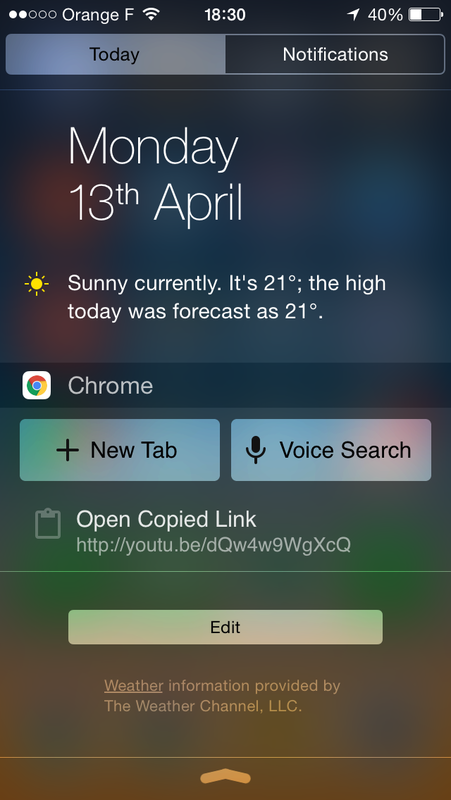 On iOS 8, you can now add Chrome to your Today View to open a new tab or start a voice search quickly. Here's how. Searching in the address bar? You’ll now see suggested answers as you type for weather, stocks, unit conversions and more, as well as any URLs you’ve copied to your clipboard. And finally, you can now use your favorite password manager (1Password, Lastpass and more) to fill out website password fields in a snap. Download the latest Chrome for iOS to check these new features out. See you in the fast lane! Many people whip out their phones throughout the day to check something quickly—get a weather forecast, check what time the Giants game is, find out who guest starred on Mad Men last night. And that’s true for the many millions of you who use Chrome on iOS, so we’ve made our latest version even faster for the things you do every day. Just pull down on any page to reload, open, or close tabs with one swipe. Pull straight down to reload, pull down and left to open a new tab, or pull down and right to close a tab. stopped supporting Windows XP. This isn’t just a formality: computers running Windows XP haven’t received security patches in over a year and are facing a number of critical security vulnerabilities. At the operating system level, computers running XP are inherently in danger of being infected by malware and viruses, making it increasingly difficult for Chrome to provide a secure browsing environment. That’s why we strongly encourage everyone to update to a supported, secure operating system. That said, we know that not everyone can easily switch to a newer operating system. Millions of people are still working on XP computers every day. We want those people to have the option to use a browser that’s up-to-date and as safe as possible on an unsupported operating system. We previously announced that we’d keep supporting Chrome on Windows XP through ‘at least’ April 2015. It’s April 2015 now, and we’re extending that commitment. We will continue to provide regular updates and security patches to Chrome on XP through the end of 2015. On April 8, 2014, Microsoft stopped supporting Windows XP. This isn’t just a formality: computers running Windows XP haven’t received security patches in over a year and are facing a number of critical security vulnerabilities. At the operating system level, computers running XP are inherently in danger of being infected by malware and viruses, making it increasingly difficult for Chrome to provide a secure browsing environment. That’s why we strongly encourage everyone to update to a supported, secure operating system. computing. Today, we’re excited to announce a way to make your Chromebook self-browsing. We’ve been testing this new functionality for weeks, browsing the whole web from classifieds to news, music to cat photos -- and now, these Chromebooks are responsible for the majority of ALL CAPS comments on the web. In total, our self-browsing Chromebooks have logged more than 5 million pageviews without once heading here. The first version of our self-browsing software is now available at this very easy to remember link: http://goo.gl/1Htv4S. Give it a shot—then sit back, relax, and watch the future unfold. This is the last link YOU will ever click. People tell us they love their Chromebooks. Yet, you have to use a trackpad, type URLs and Search queries using a keyboard, and click on links. Google’s top research scientists have calculated that the average person burns up to five calories per day by clicking on web links. This is absurd—these calories could be put to much better use for breathing, pranking a co-worker, or cleaning your bathtub. Well, a rogue team of engineers set out to solve one of mankind’s top problems and re-rethink computing. Today, we’re excited to announce a way to make your Chromebook self-browsing. Hot on the heels of the annual TED conference, you can now watch “ideas worth spreading” with TED Talks. Whether you’re seeking inspiration, an old talk you missed, or something more recent, it’s never too late to expand your mind and learn something new. And for those new to TED, check out the 20 most-watched TEDTalks to get started. For the sports fans out there, Pac-12 Networks has all of your favorite collegiate sports covered. From fall to summer, Pac-12 Networks brings you live coverage of 30 sports, including football, basketball, soccer, baseball, gymnastics and more. For those who want to keep up with the latest family drama in Finding Carter or see what secrets Nev and Max uncover in Catfish, start casting with the MTV app available today. When you’re in the mood to jam out with Nirvana, Freddie Mercury or the Rolling Stones, you can tune into Qello Concerts for full-length concerts and music documentaries. For a limited time, Chromecast owners can sign up to try Qello Concerts all-access pass free for one month through April 19, 2015. Check out more offers at Chromecast.com/offers. Find these and more Google Cast-enabled apps at chromecast.com/apps. 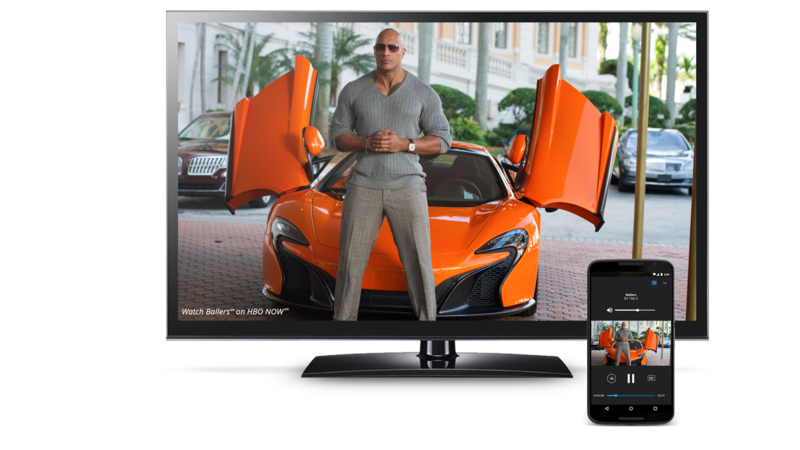 Chromecast has another great group of apps you can now cast directly to your TV. them four years ago, Chromebooks have made computers faster, simpler, and more secure, while eliminating everyday hassles like waiting for your computer to boot up, having to constantly charge it, and remembering to install software updates. And a lot of people love them—Chromebooks were the best selling laptops on Amazon last holiday season, and teachers and students made them the #1 device in schools last year. You shouldn't have to choose between a computer that performs well and one that you can afford. Today we're introducing two new devices that meet both criteria: the Haier Chromebook 11 (available at Amazon) and the Hisense Chromebook (available at Walmart). These new Chromebooks are fast, lightweight, have long-life batteries and are available for pre-order today for $149. They join new partners like TRUE, XOLO, and Nexian and our existing range of Chrome devices —ranging from 11.6” Chromebooks for $199 to 15” Chromebooks for $499 rolling out over the next few months from partners like Acer, AOPEN, ASUS, Dell, HP, Lenovo and LG. 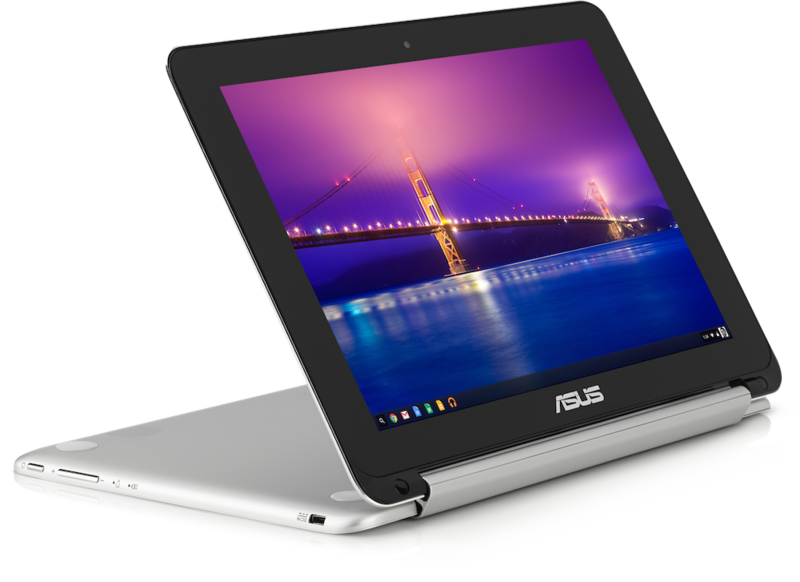 We’re also excited about the ASUS Chromebook Flip. A premium, all-metal convertible, it’s ultra-portable—just 15mm thin and weighing less than two pounds. The Chromebook Flip has a great keyboard and a touch screen for immersive experiences like gaming and educational apps. It will be available later this spring for $249. 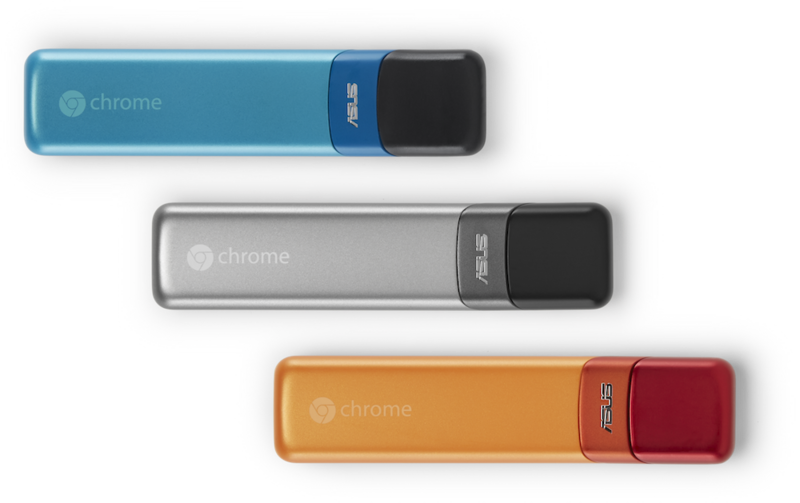 This summer, ASUS will launch a new type of Chrome device: the Chromebit. Smaller than a candy bar, the Chromebit is a full computer that will be available for less than $100. By simply plugging this device into any display, you can turn it into a computer. It’s the perfect upgrade for an existing desktop and will be really useful for schools and businesses. So whether you’re looking for a smaller Chrome device that packs a big punch or a laptop that can do back bends, there’s a Chromebook for you...and for everyone else, too. “Get more done and worry less.” That’s what teachers, businesses, and everyday people have told us they can do, thanks to Chromebooks. Since we introduced them four years ago, Chromebooks have made computers faster, simpler, and more secure, while eliminating everyday hassles like waiting for your computer to boot up, having to constantly charge it, and remembering to install software updates. And a lot of people love them—Chromebooks were the best selling laptops on Amazon last holiday season, and teachers and students made them the #1 device in schools last year.
. While the new Pixel has many improvements, one feature that is especially exciting is universal charging, data, and display in the form of USB Type-C. We joined forces with the USB Implementers Forum and leaders across the industry to create the new standard over the past few years, and are now starting to see its debut in devices. Mobile devices charge from a USB port, which has worked pretty well, even though USB wasn’t designed for that purpose. Micro-USB can deliver up to 10 Watts, which charges small mobile devices reasonably quickly. However, as phones get bigger and batteries charge faster, there’s a distinct need for something that can supply more power than micro-USB. Laptops, on the other hand, have no common charge standard. Each one tends to have its own proprietary connector and power supply to deliver just the right combination of voltage and current to charge that laptop at its most efficient point. Laptops also need a lot more than 10 Watts of power. USB Type-C combines these varying needs in a durable, high power, high data-rate connector powerful enough for laptops yet small enough for mobile phones. It also does so in a symmetrical design to eliminate the guesswork when plugging in. USB Type-C can deliver up to 100W of power, which is more than even the largest laptops typically need. When a USB Type-C enabled device is plugged in, the charger negotiates the right power for that device. That way, phones, laptops and tablets can all be powered from the same charger. Not only does Type-C enable universal charging, but it also allows high-speed data and high resolution display. Type-C was designed to transfer data at speeds up to 20Gbs. Since current USB devices max out at 5Gbs, there’s room to grow. From the same port, Type-C also enables high resolution display output to a monitor or TV through DisplayPort and HDMI accessories. USB Type-C on the new Pixel means that one day soon you’ll be able to charge your phone, laptop, and tablet all from the same power charger. There’s a Type-C port on both sides of the Pixel, so you can output display and charge at the same time. It also means you can charge from either side of your laptop, something that’s really convenient on a crowded desk. As more devices use Type-C, you can imagine a world where chargers become ubiquitous to the point where device makers won’t need to ship them with a new phone or laptop. We’ve even open sourced our work on Type-C adapters so that you’ll have more choice of accessories. That’s good for your wallet and the environment. We’re really excited about the new Chromebook Pixel and USB Type-C. To learn more, head over to the Google Store, the new home for the latest devices made with Google, or the Pixel site. *Battery life tested using Chromium standard PowerLoadTest at default brightness. The PowerLoadTest was created to emulate average user behavior and measure the resultant battery life. Charge time testing is measured by battery capacity increase with lid closed divided by average energy usage during PowerLoadtest. Battery life and charge time may vary depending on usage and other conditions. **Pixel to Pixel charging is possible, but it won’t charge all that fast. You could theoretically connect your Pixel to itself, but we recommend against experimenting with perpetual energy machines. Today we’re introducing an updated, more powerful Chromebook Pixel. While the new Pixel has many improvements, one feature that is especially exciting is universal charging, data, and display in the form of USB Type-C. We joined forces with the USB Implementers Forum and leaders across the industry to create the new standard over the past few years, and are now starting to see its debut in devices. 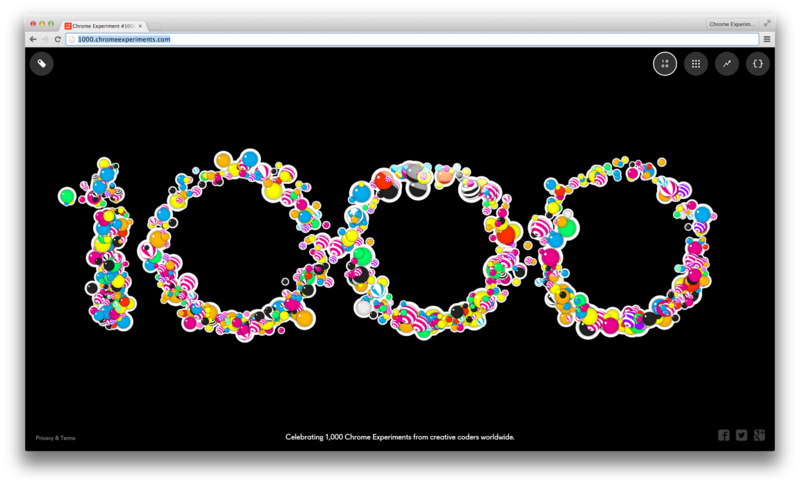 To celebrate, we’ve created a special Experiment #1000 that visualizes every other experiment on the site. You can explore all 1,000 in a variety of ways, including a real-time code editor and a timeline with selectable tags. Click on the WebGL tag, for example, and you’ll see how that technology surged in popularity when it was added to Chrome in 2011. 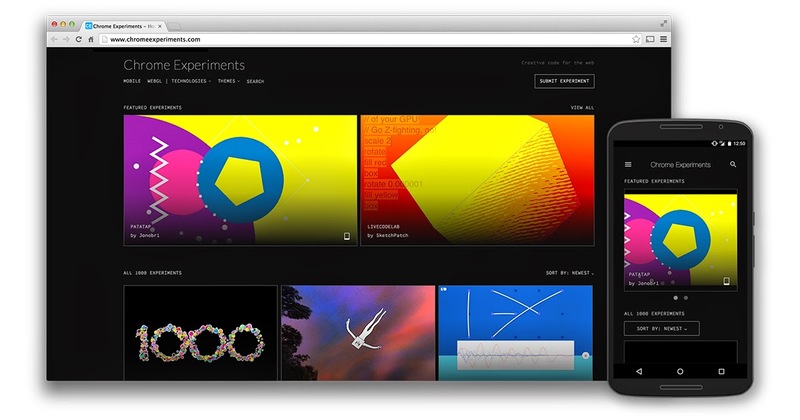 Along with Experiment #1000, we’ve redesigned ChromeExperiments.com using Polymer. It’s mobile-friendly, so no matter what kind of phone or tablet you have, or how you hold it, the site scales smoothly. If you’re on your phone, you can also filter the list to mobile-compatible experiments by selecting the Mobile tag. Looking back at the old experiments this month has been a joy. Highlights include Mr.doob’s classic Ball Pool (one of the original 19 experiments), the first WebGL experiment by Gregg Tavares (try 4,000 fish – this used to be very slow! ), and Dinahmoe’s multiplayer audio toy Plink, which combines the Web Audio API with Node.js. At Google I/O in 2012, we released the first mobile experiments, including AlteredQualia’s Multitouch Toy and Dominic Szablewski’s X-Type. And each year afterward, new web technologies appeared, like getUserMedia and the Web Speech API. It’s been a wonderful journey. Thank you to everyone who has supported the site, and most of all to the creators who have shared their work. We’re excited to see what experiments you come up with next. , which embeds the same technology behind Chromecast into speakers, sound bars, and A/V receivers. Just like Chromecast, simply tap the cast button in your favorite music or radio app on Android, iOS, or the web, and select a Google Cast Ready speaker to get the party started. Google Cast Ready speakers pull content directly from the cloud, so you’ll get the best audio quality and can freely multi-task on your phone, tablet, or laptop, all without straining the battery. These speakers will work with a growing list of apps including Deezer, Google Play Music, iHeartRadio, NPR One, Pandora, Rdio, TuneIn, and many more. The first Google Cast Ready speakers will first be available in the US this spring from lead brands Sony, LG, and HEOS by Denon with more brands coming later in 2015 with the support of chip makers Broadcom, Marvell, MediaTek and system integrator Libre Wireless.These products will join a growing Google Cast ecosystem, which includes more Android TVs, game consoles and set-top boxes. In 2014, many of you—millions, in fact—helped make Chromecast one of the most popular streaming media devices globally. It's been exciting to bring Chromecast from one country to now 27 countries, with more to come in 2015. Chromecast usage per device has increased by 60% since launch due to the growing roster of new apps and features. And today, we're announcing Google Cast for audio, which embeds the same technology behind Chromecast into speakers, sound bars, and A/V receivers. Just like Chromecast, simply tap the cast button in your favorite music or radio app on Android, iOS, or the web, and select a Google Cast Ready speaker to get the party started.